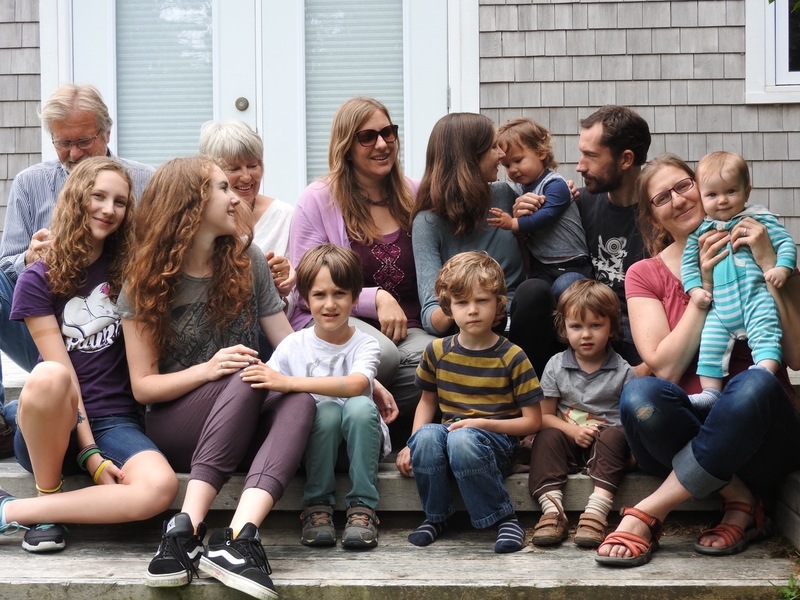 so…a week after our return, this is what we’ve been up to since then…Tish and three of her brood, Jen and her three, Drea and all her family, us..
Now…try to get everyone to smile on command…won’t work. Frank has the remote for the camera in his hand, none of us were ready…result? Perfect. We had hours today before we needed to catch a Red-Eye near midnight…so…we spent eight hours (!!) 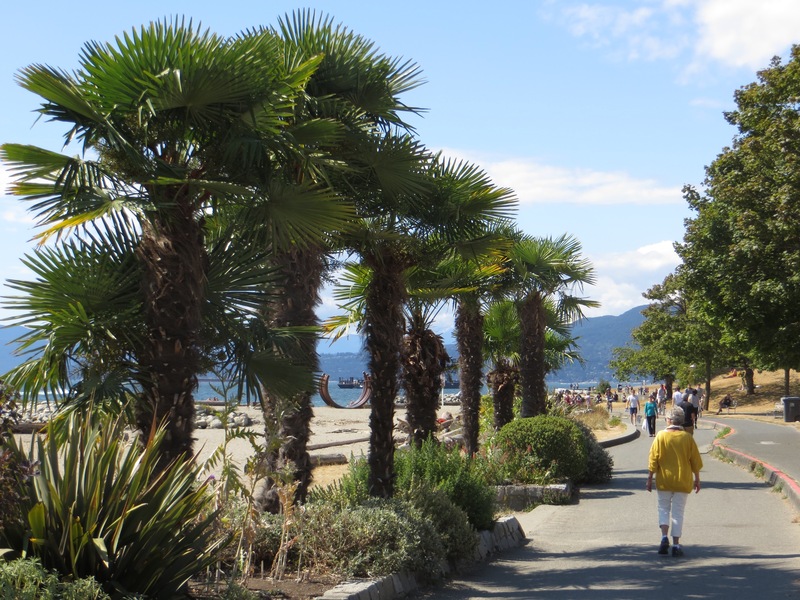 walking Vancouver. 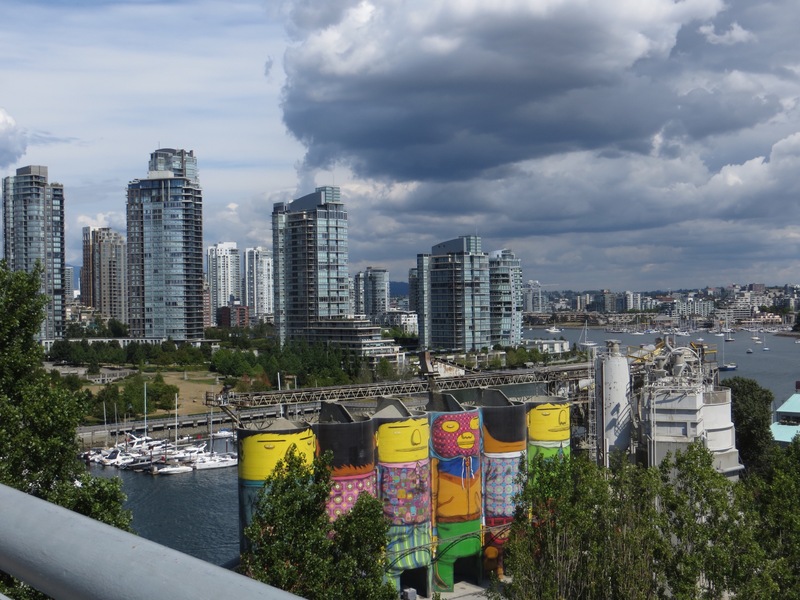 We set out on an “art walk” to galleries, which was great, but this art spotted as we walked over the Granville Bridge that crosses False Creek, was the coolest. You could see fine gravel or sand pouring into one of the “heads”. This was another piece of unexpected “art” we came across, walking the same bridge. On the other side of the bridge we had seen Granville Island below us…this side was trying to make up for not being as interesting. 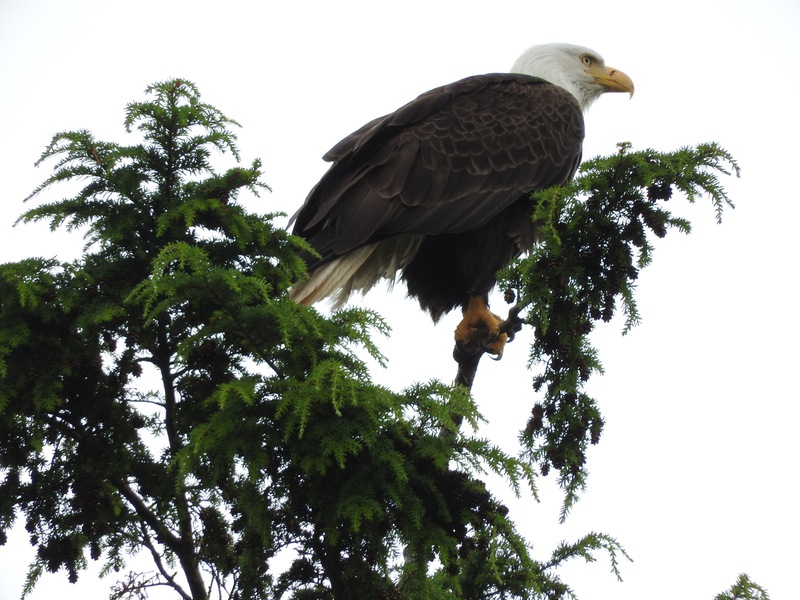 Both of us thought…”look, an eagle!! !” … And the next second realized this eagle kite was tethered to an almost invisible string (see it to the left of him) and he moved about with the wind. Loved it. 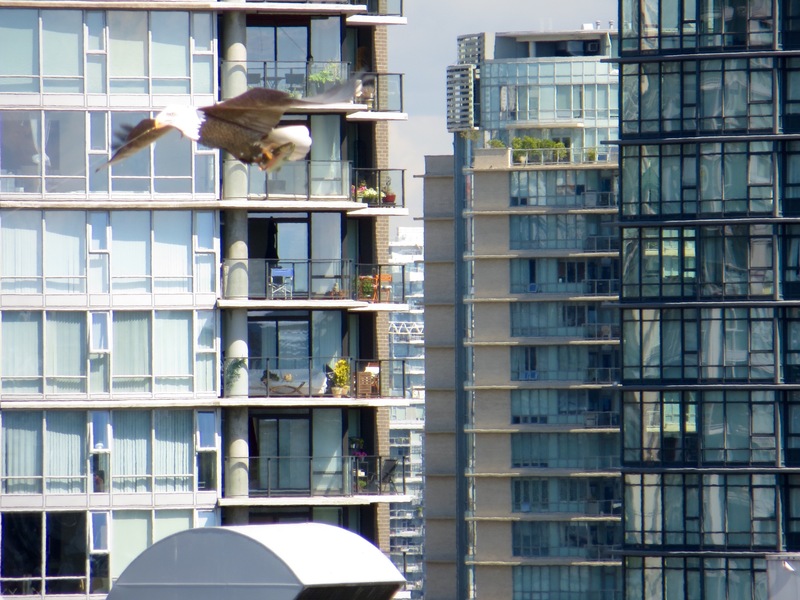 He soared and dipped and flew up again. We may need this in our ‘hood. …from the shade of a bar, windows wide open..Happy Hour Time happening… here I’m enjoying a Bellini cocktail for $4. When Frank wanted a dessert for $8 I said we could have two more drinks for that price! We didn’t ….we hoofed on back to our hotel at the Vancouver YWCA Hotel, where they had kindly kept our bags after check-out, and headed to the airport to REST before our flight. 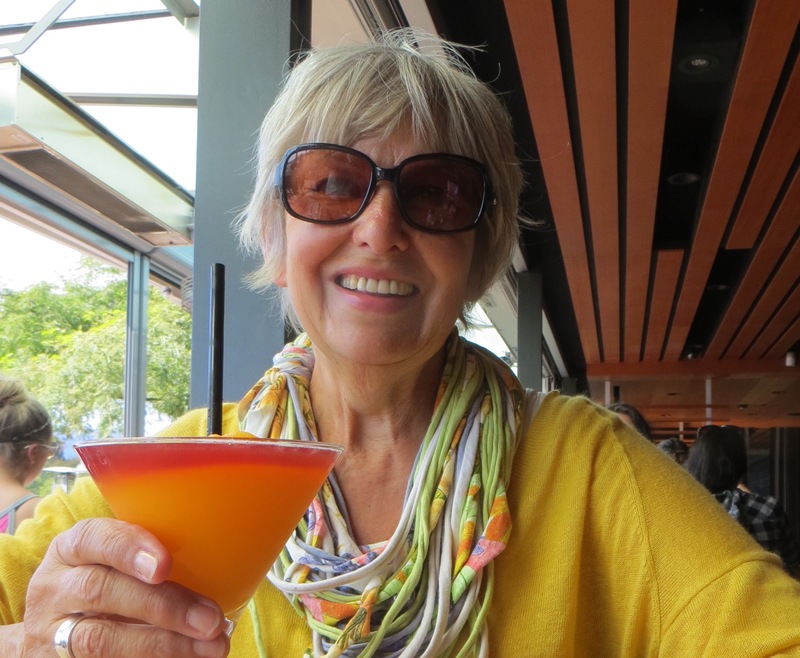 So, with this drink in my hand, I bid you readers a good summer, as I take time off from this blog ..indefinitely. 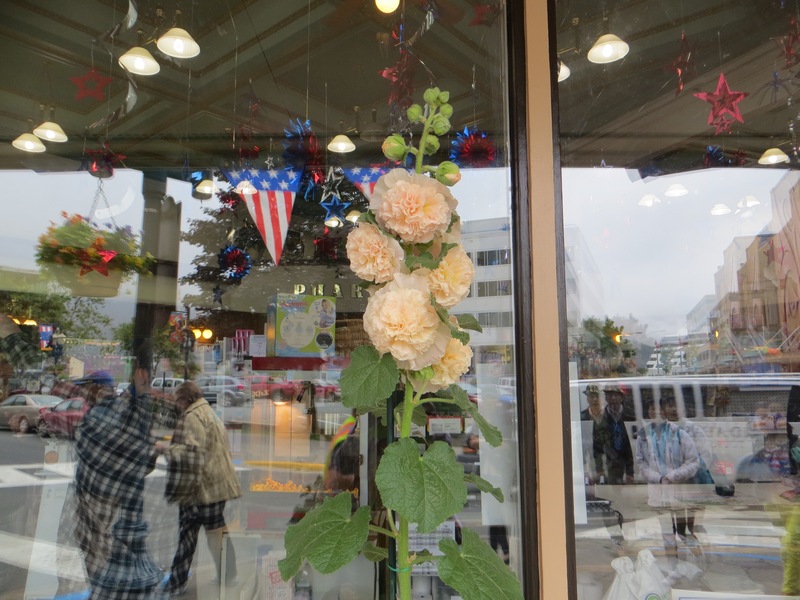 Thanks for sharing this long trip with me….remember that you only have “today” (from someone who has watched herself age over the years of this blog, and is happy to “be” here). 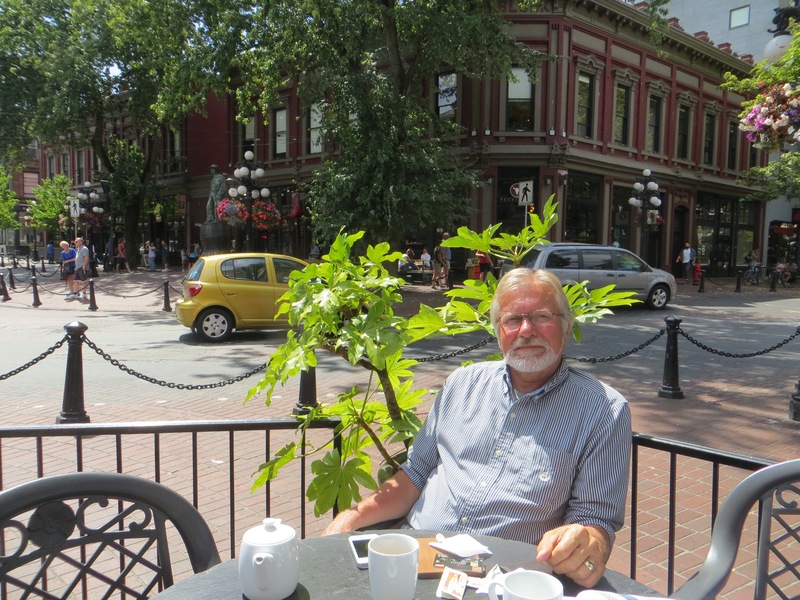 We left the ship and the “official” holiday/adventure ended…but we still had a day to spend in Vancouver..
A hot summer day, and we took advantage of that with lunch outside at a busy corner in the Gastown District. We had just had a visit with a friend of Jen’s from our Peterborough days and had a lot to reflect on…on how attached you get to your children’s friends… having them in your home so often, watching them grow up, meeting them again as full on adults, sometimes with children of their own. A real treat and even a privilege. Waiting for another treat arriving by seatrain..
Alison and Karin drove in from Kelowna, had dinner with us, and tomorrow head off for Tofino. So great that this impromptu get-together worked out. What a lovely way to finish off the vacation, with family and friends. 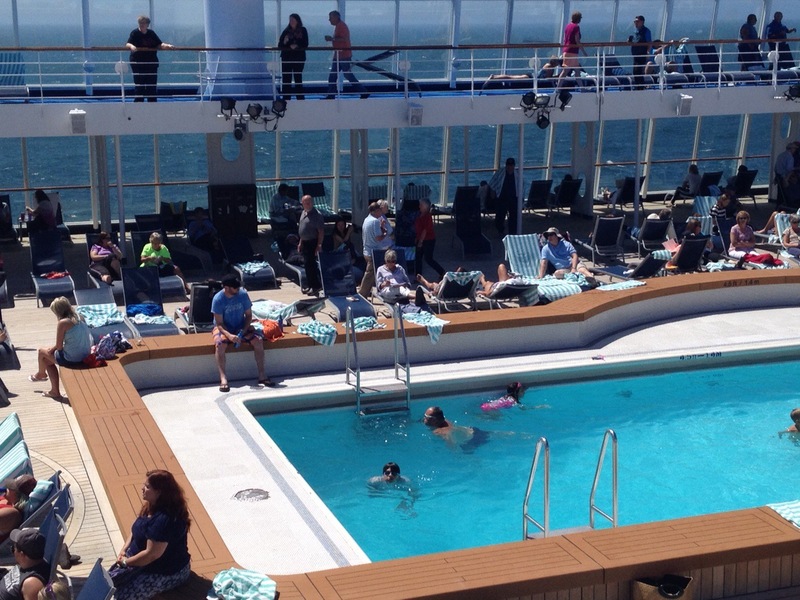 Great weather on our last day at sea before disembarking tomorrow a.m. See me poolside on a lounger? Heaven…just relaxing, completely. 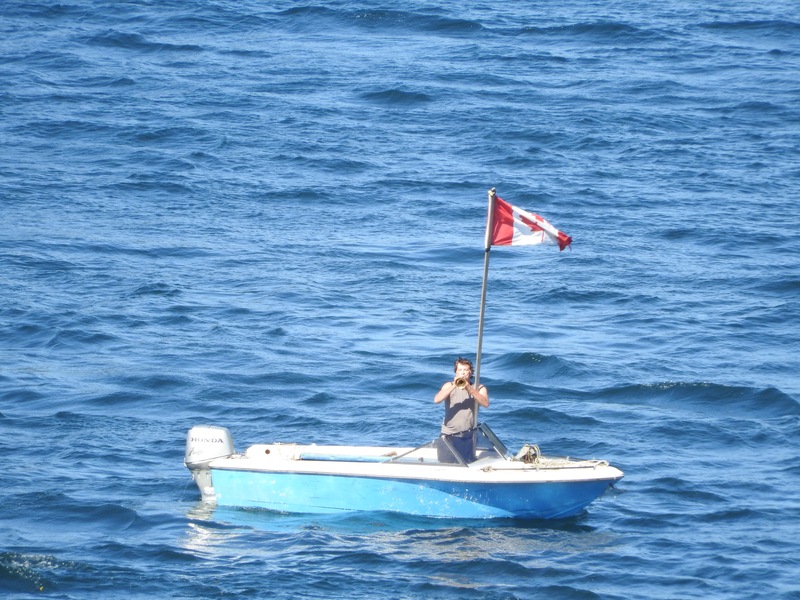 As our ship sailed into British Columbia’s Strait of Georgia, between Vancouver Island and the mainland, this fellow bugles “Oh Canada” for us…badly, but we loved it. We ate dinner outside, as we had breakfast. Will miss the food service! ..and didn’t turn in till 11 p.m., just watching the sea. 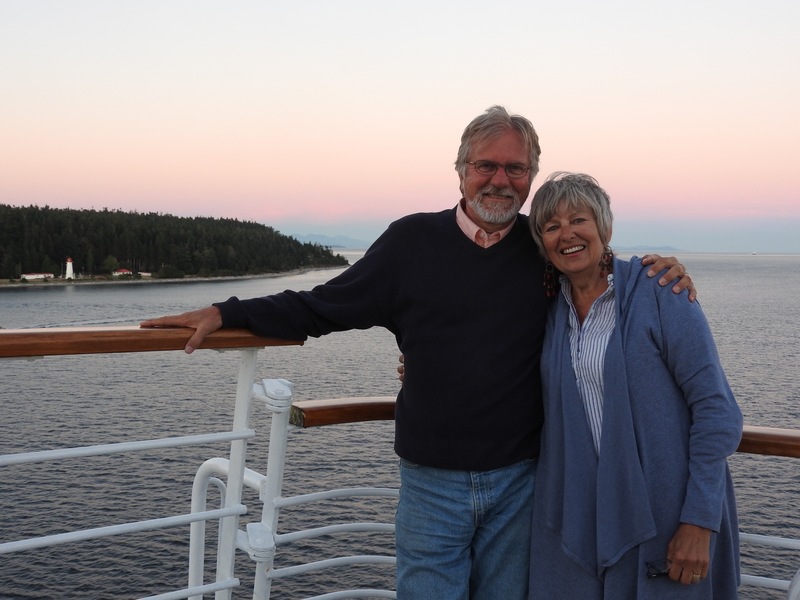 A fellow passenger who,had once been in medical school in N.S., wanted to take this photo of us, as it looked like a scene straight from our home province. Goodnight and Goodbye to our cruising days. 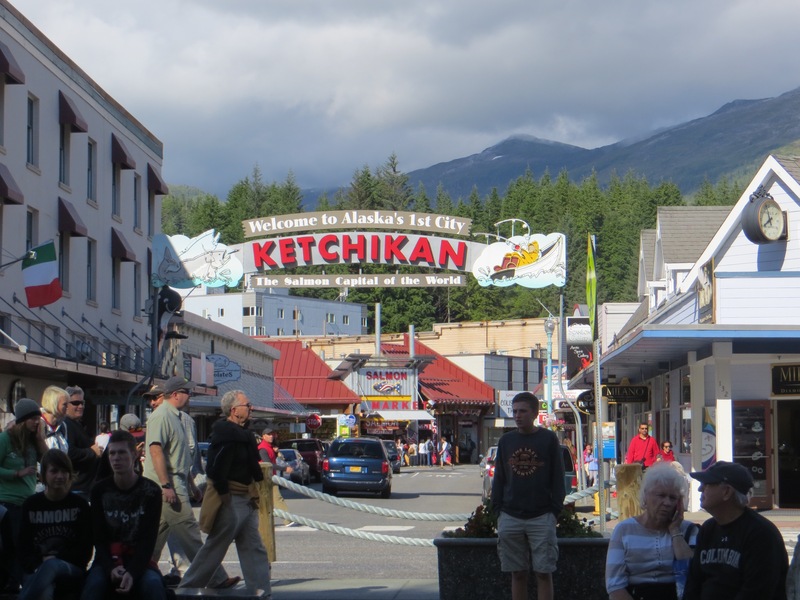 Well, the weather switched to warm, which was quite lovely as we explored Ketchikan, a city that was once a gold prospecting town, with a large Red Light area along Creek Street, which was built over the top of Ketchikan Creek. 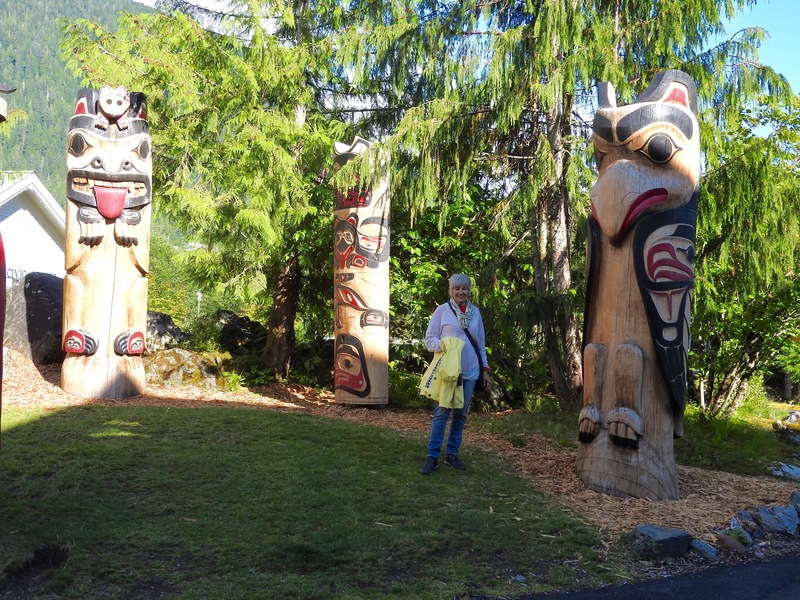 And plenty of Totem Poles.. 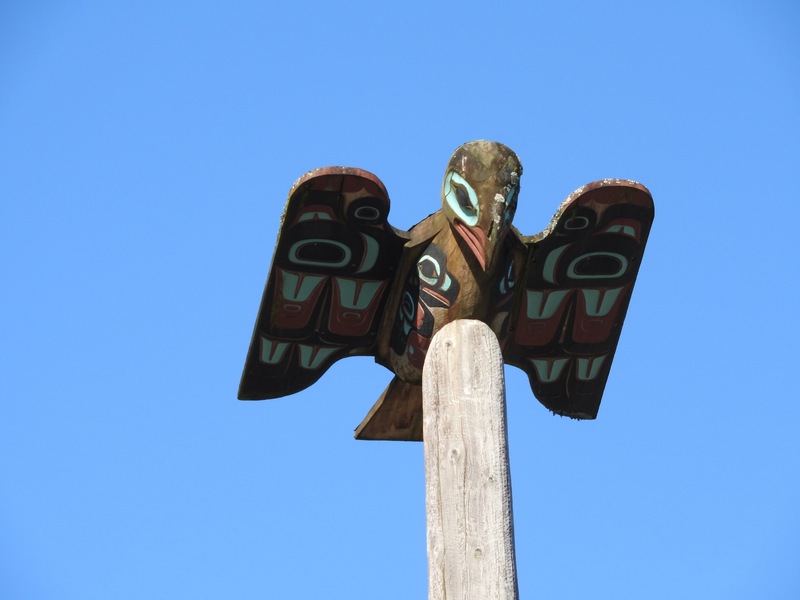 Being considered to be of the Raven Clan, this was my favourite. 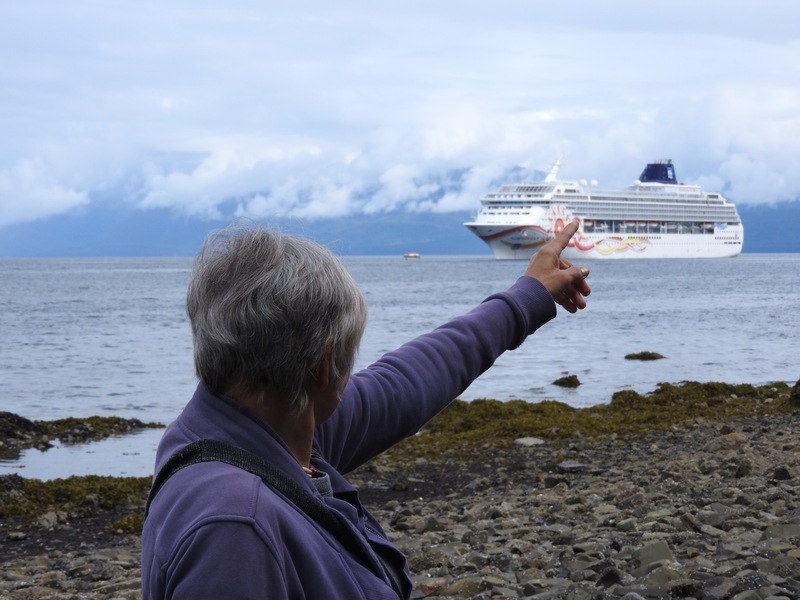 We took an eagle watching boat tour…there I am trying to adjust my binoculars..and there is our very entertaining captain. 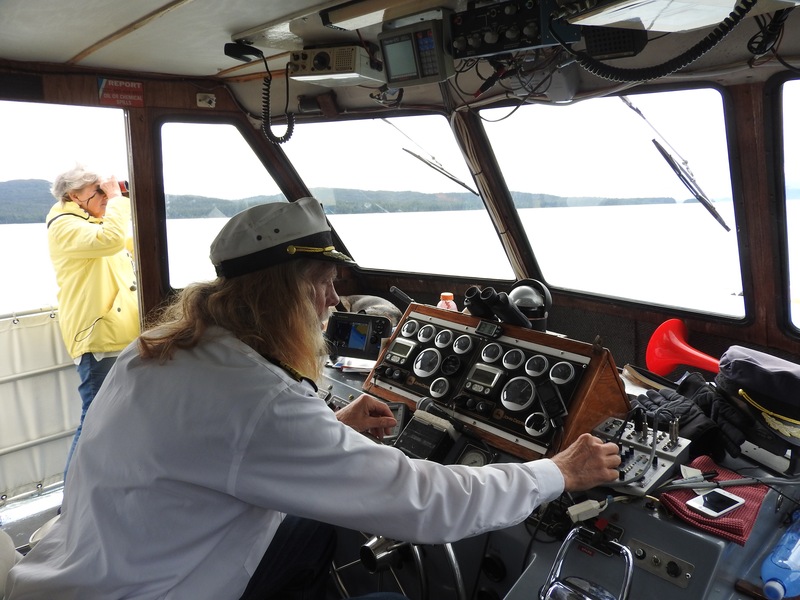 To his left his dog is curled up in a bed beside the instrument panel, and to his right is a bugle with which he “called” whales but that didn’t materialize for us. ..but the Eagles did! 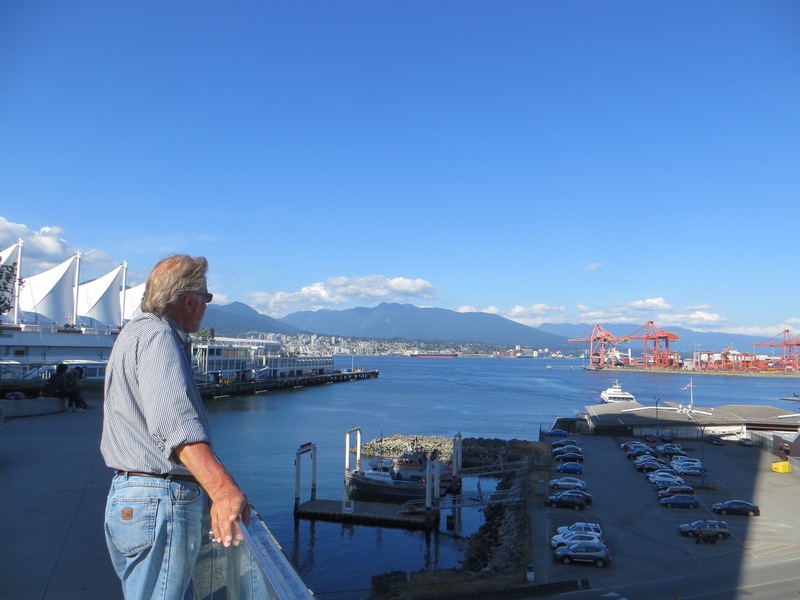 I know we can see them at home too, but it was a good way to spend time off the ship without looking at stores, and who would eat on shore when it’s free on board? So a good time. 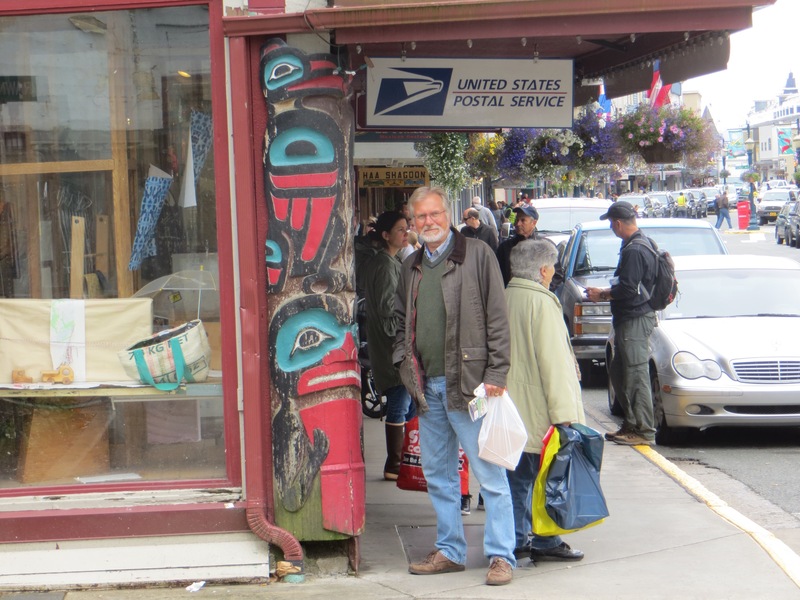 .and even past the Totem Heritage Centre, behind us in this photo. I read Emily Carr’s book “Klee Wyck” before leaving N.S.. She wrote about getting boated out to islands , about 1941, which had been abandoned but the Totems left behind as a permanent reminder of the past. 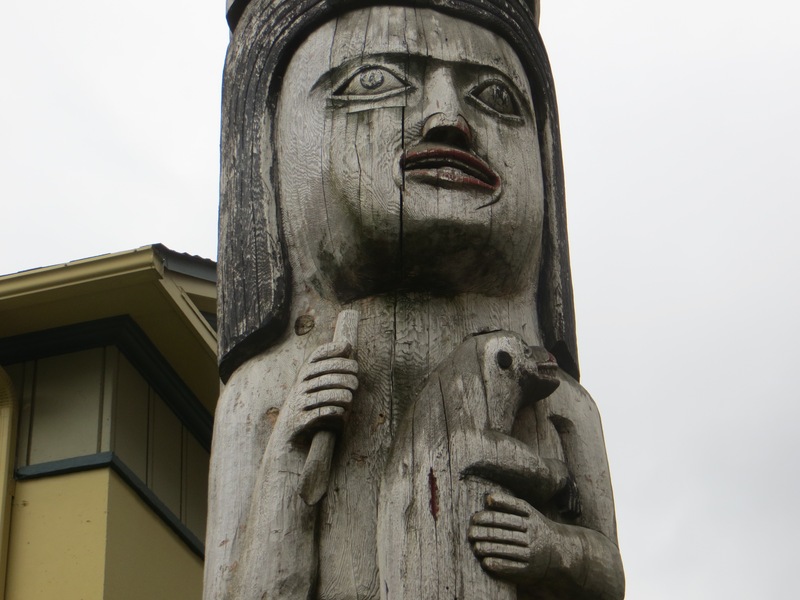 It is from these journeys that Emily Carr created her paintings. 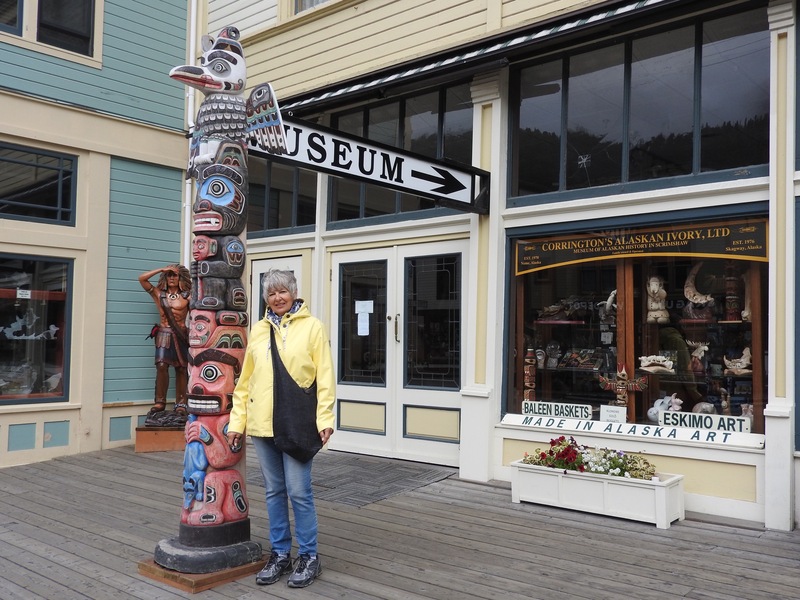 Read it if you get the chance and you’ll have a better understanding of the history of the coast of British Columbia on up into the Alaskan coast. 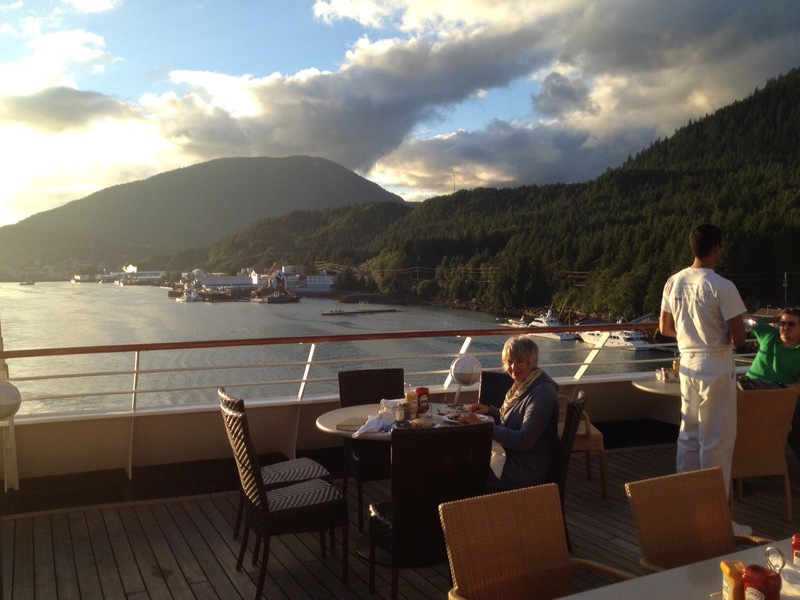 Back in Skagway, but this time from the cruise ship. Having been here before, RVing, we didn’t explore it for long. It was cold and windy, and our lovely home on the water called us back. I’m the only one on the deck..it’s that cold. 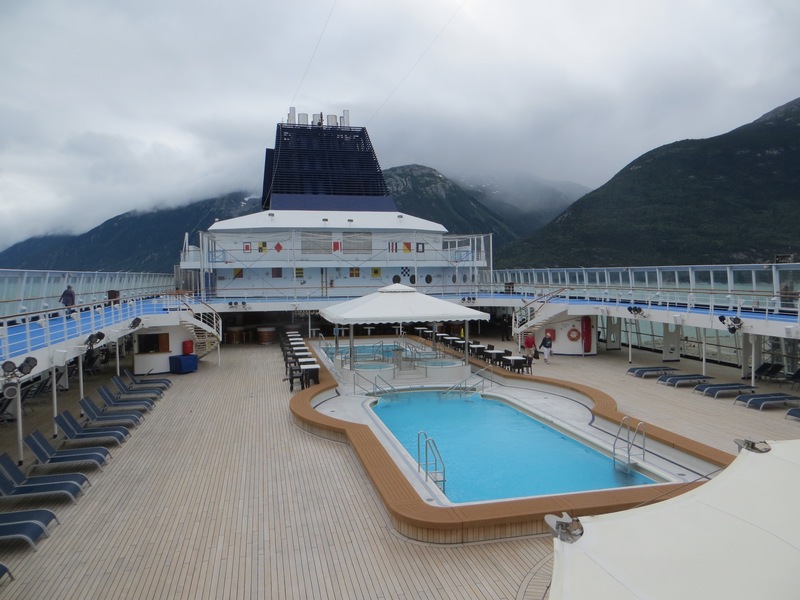 This deck could be so much fun if the weather was good, but the cruise staff are telling us that this is the first week without constant rain. 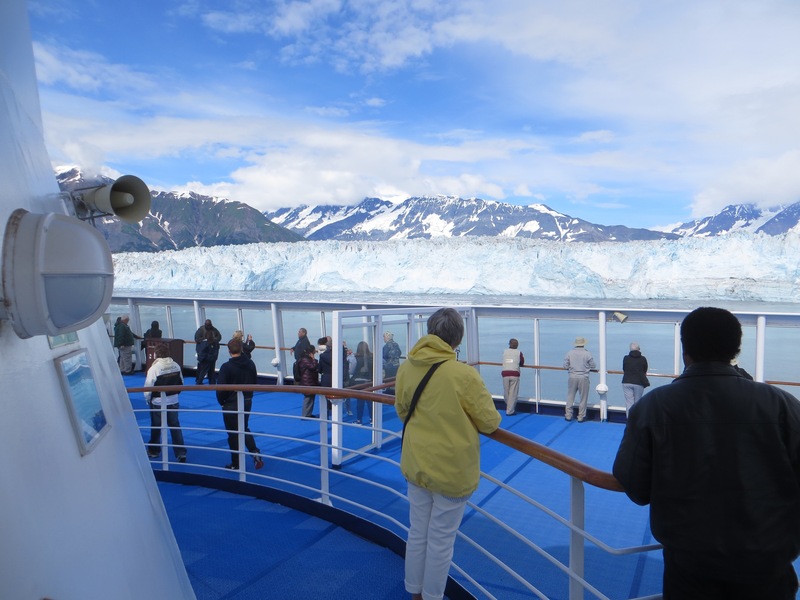 It is Alaska, after all, and not a Caribbean Cruise. So we “chilled out” and read and enjoyed our free food and drink options. Now I know why people fatten up when they take a cruise! 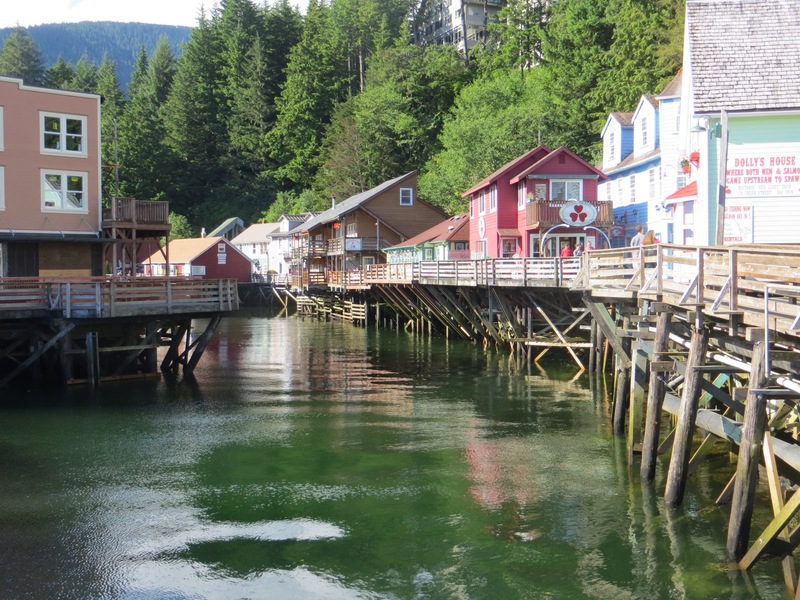 In Juneau, the capital of Alaska, though you can only fly, boat or dog sled into it. 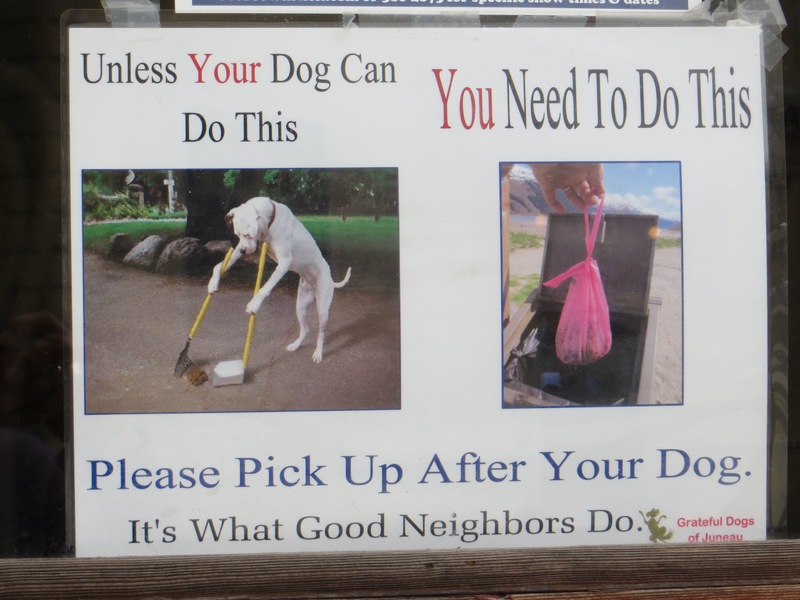 I liked this notice from the dogs of Juneau..
…and all the action of the city depicted in this photo as I was admiring the plants! 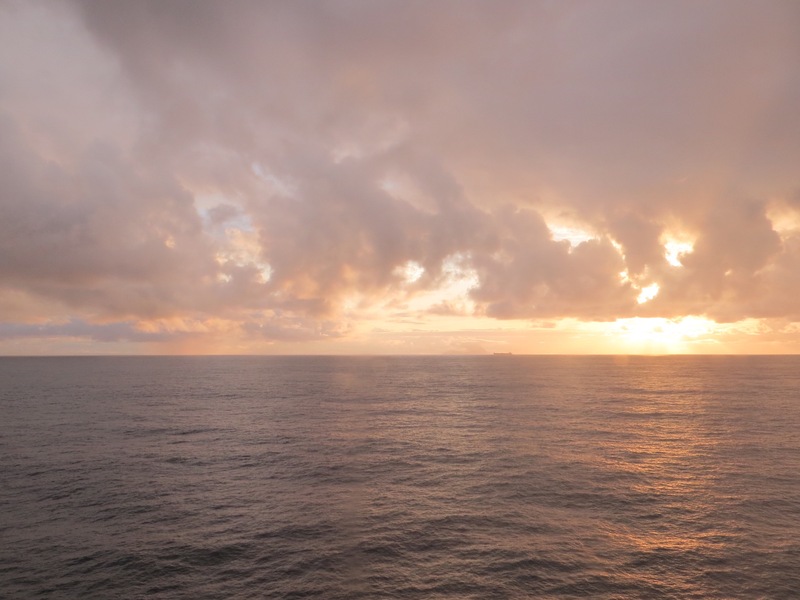 Back on board in the afternoon, our captain once again awed us and frightened us! 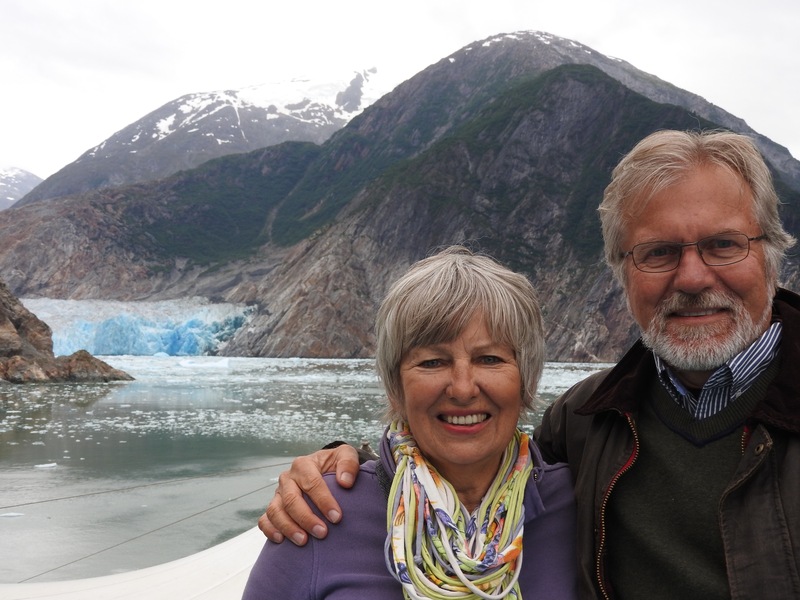 with his skill of manoeuvering this ship through the winding Tracy Arm Fiord often doing 90 degree turns, to get us almost on top of..
..the Sawyer Glacier. 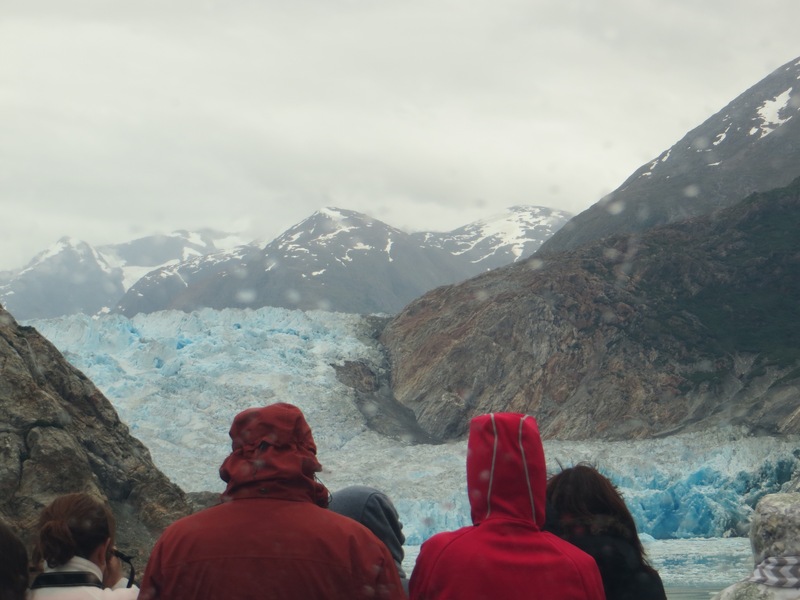 These passengers have actually turned to ice. The rain felt like sleet, the wind like needles, but the sight was a marvel. Hard to smile when your’re shaking! A lovely German couple took this of us, and we did one of them. 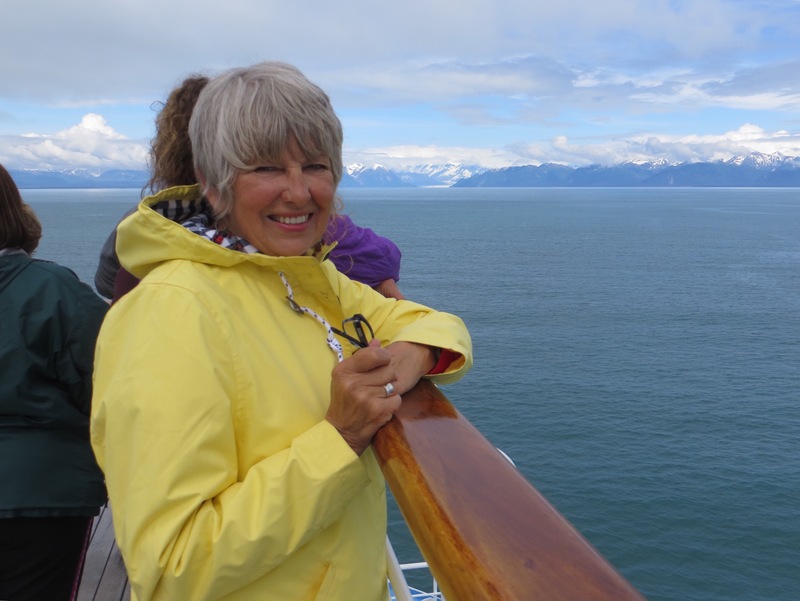 The wife, 62 years old, had dreamed of seeing Alaska since she was 23! 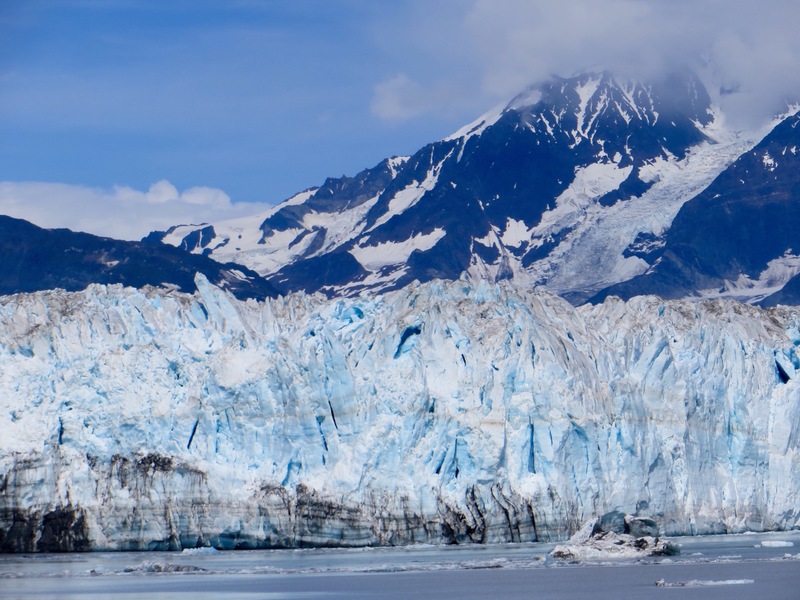 Our huge North American continent lures travelers from around the world…the space is what they are amazed at. Always interesting to strike up these conversations with strangers, here on the cruise or at campsites previously. You learn things, and that’s always good. 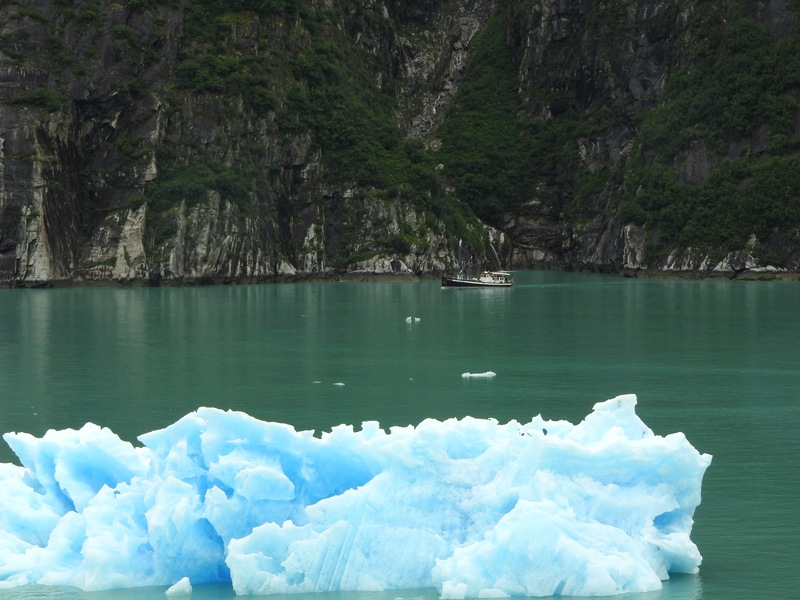 Small icebergs floated about the area. The colour…well, you couldn’t stop looking, cold as you were. See the boat by the shore? 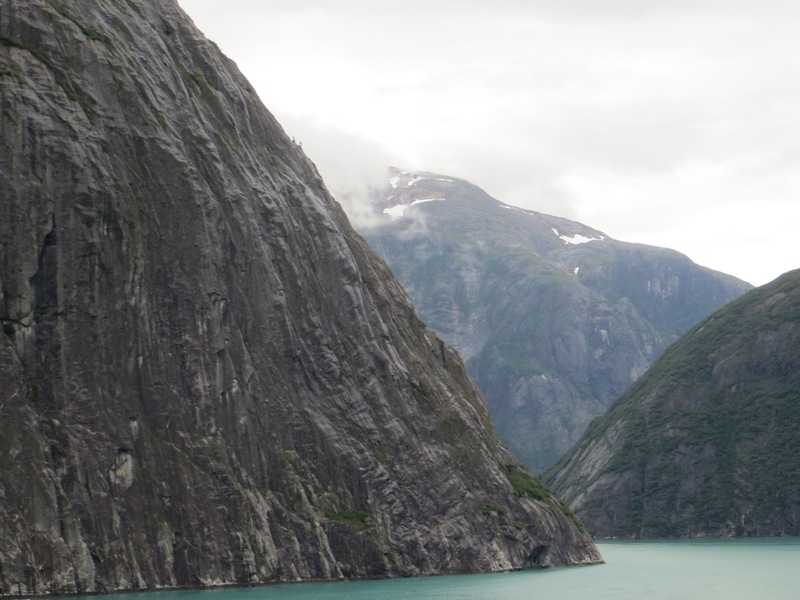 An amazing trip for them but we felt safer in the ship if we butted one of these bergs while doing our “spin abouts” one of them a 180 degree turn at the end in a space seemingly no wider than the ship! … The colour of the water, the rock formations, the drama…awwww. 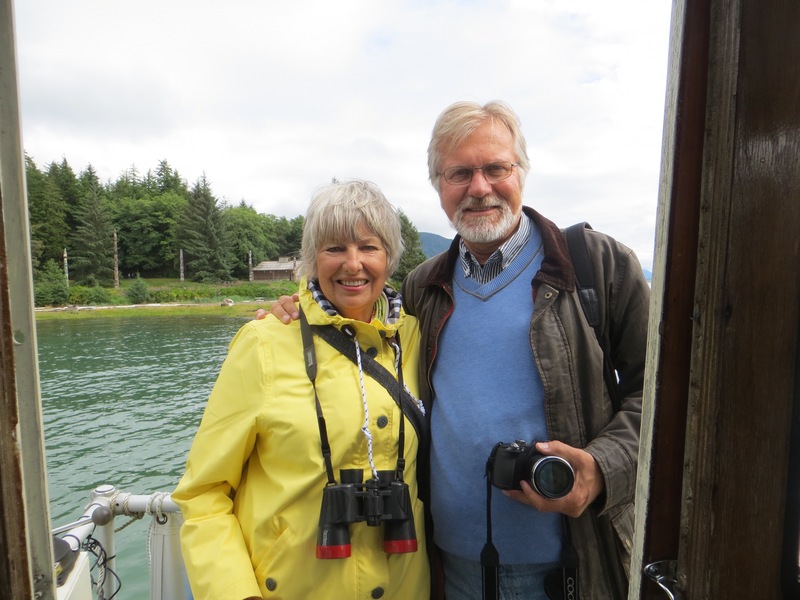 We took a “Tender” ( which is also a lifeboat) over to Hoonah, which doesn’t have a pier to accept cruise ships, but we enjoyed this ride that made the sea feel as rough as it really is. 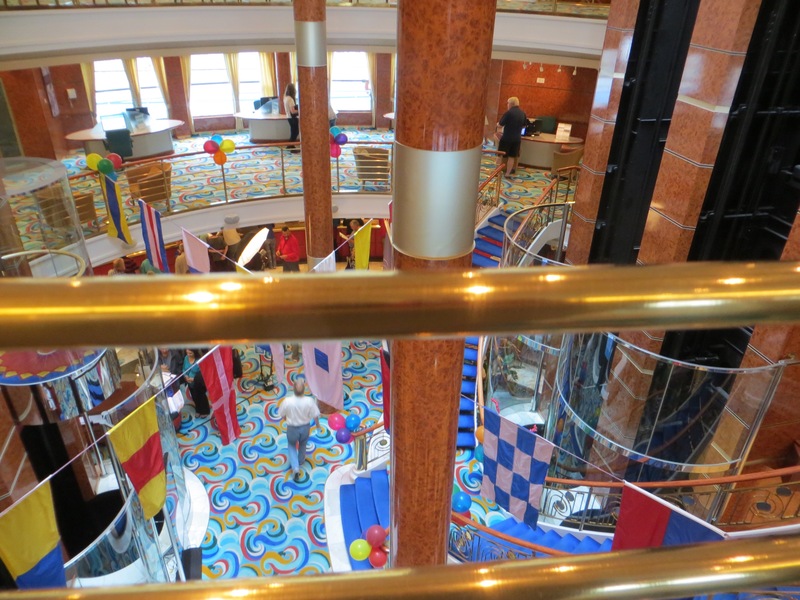 I’m pointing to our stateroom, which I continue to love. 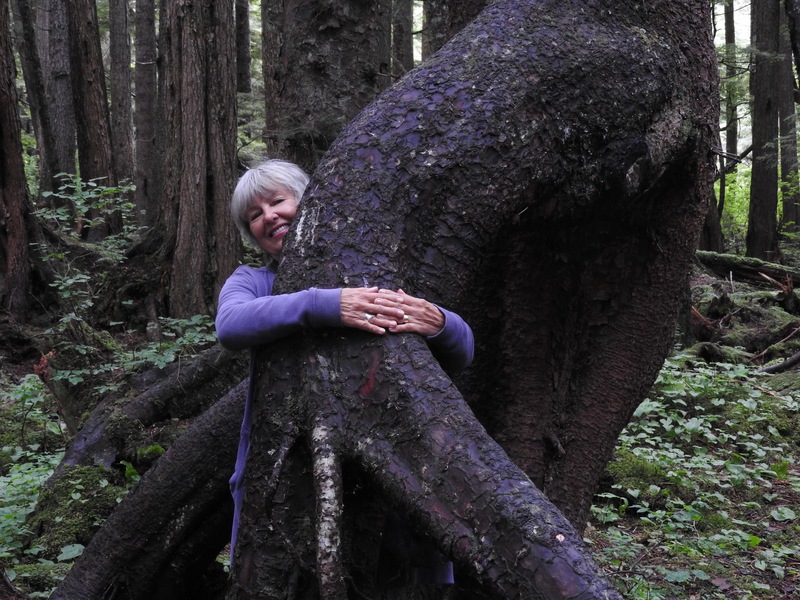 Tree-hugging in the rain forest, about as brave as we got. Others took the world’s longest Zipline which at $156 American for a minute long thrill, was our excuse for not doing it, right? 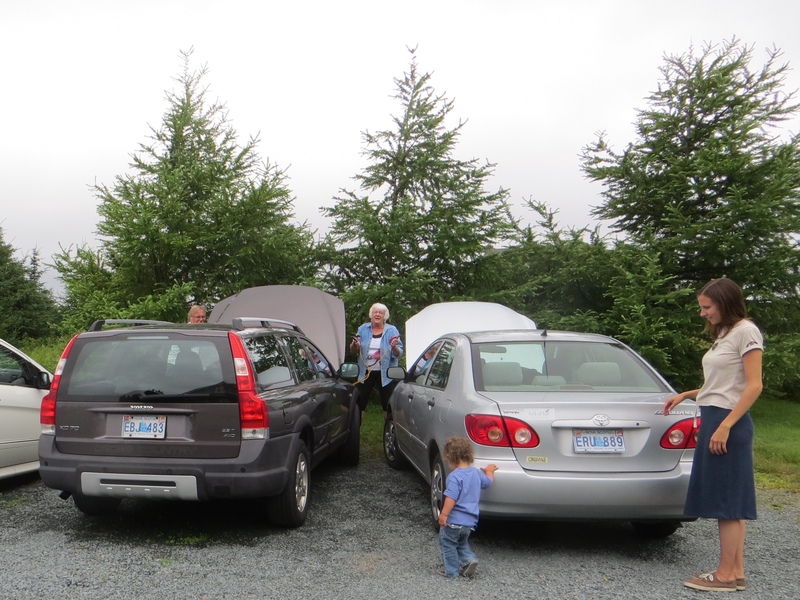 Also there were fishing excursions and whale watching, but we do live in N.S…. 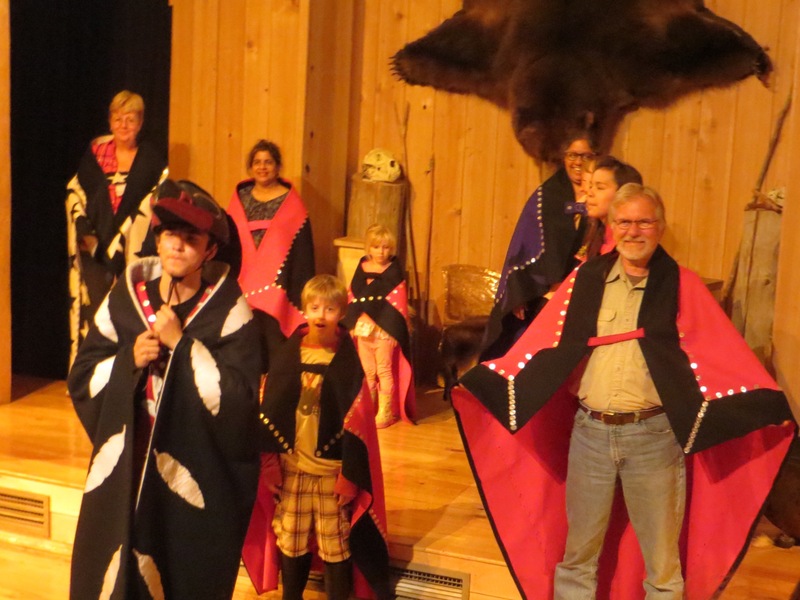 We watched a Tlinglit Native performance, that then called for audience participation…unfortunately when Frank had to dance around the room, my camera couldn’t catch the action shots. I think he may have a future career on stage… We were both assigned a card with our “family name”. Frank was from the eagle family..very fitting, sharp as he is, and I was from the raven family, which also works as I love shiny things and collecting things for our nest..
We woke up to this view outside our window..then discovered it was still the middle of the night! ..then up for the day’s action. See Frank down below? 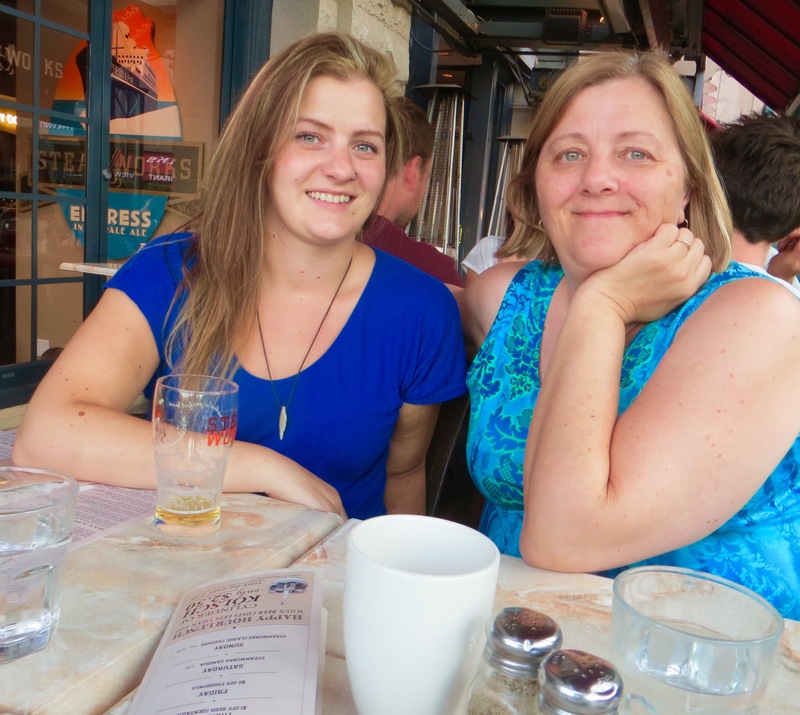 It took me an entire day to adjust to other people around, to not being on our own in our home on wheels…but eating great food while at a window seat in one of six restaurants, watching the sea, does lull you quickly. 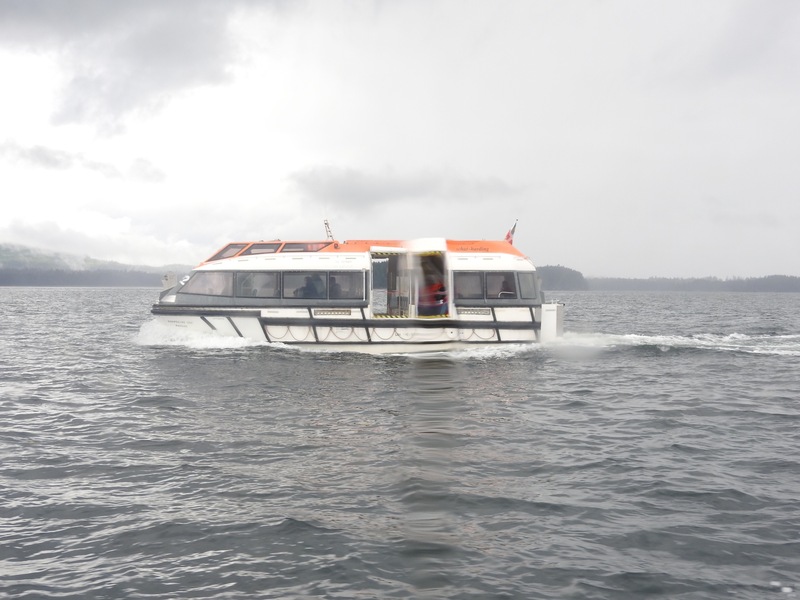 Oh, and no seasickness…such a smooth ride, better than the rough roads we drove on. We got soooo close, and the colour was really this colour. You don’t need Photoshop for nature. We were so impressed at the skill of the captain to get us into tight spots. 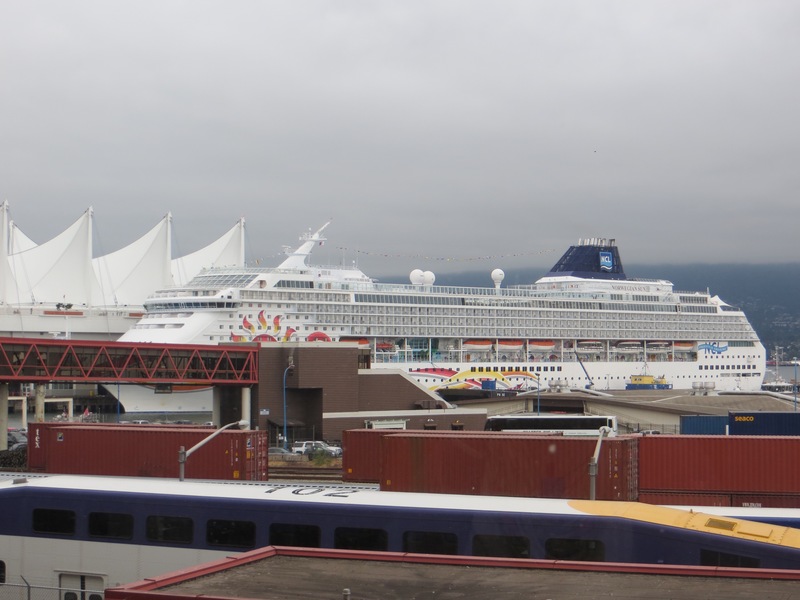 The cruise just “paid” for itself!